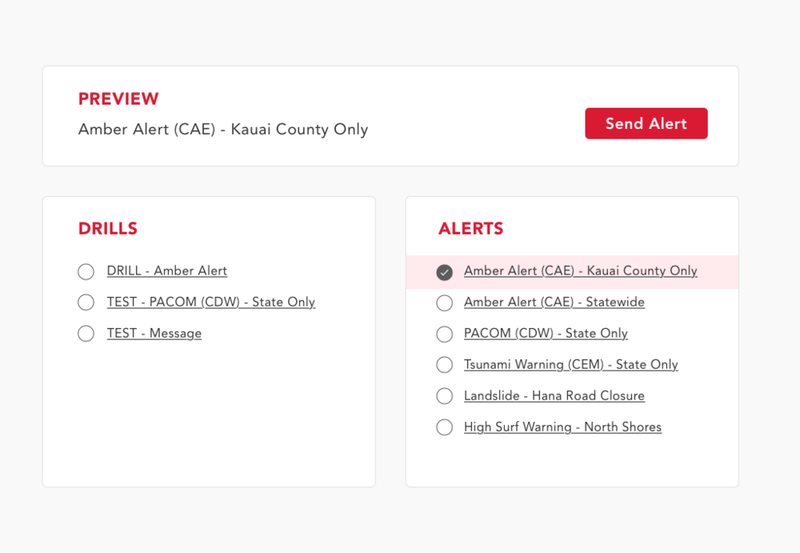 This is the UI of the alert system or at least what was found on the web. Whether or not this is real, it needs help! Let's start by grouping related links together. This will help differentiate between all the links. It's much easier to process information in chunks rather than all at once. Clear labels are important as well. Once a user clicks on a drill or alert, it will appear in the preview box. The link is then highlighted to show the selection and stays highlight until a new alert is clicked. The preview box is meant to clearly show what you'll get. If all is good, the user will click the button. After clicking "Send Alert," there is a 20 second countdown before the alert completely goes through. This gives the user additional buffer time just in case it was a mistake. From here, clicking "Skip" bypasses the countdown to 0 and "Cancel" ends the alert. While this is not a perfect solution, it's a start. I would test this with users to validate my design. As a designer, our goal is prevent human error as much as possible. We want users to get things done. It starts with carefully thinking through user flows and interfaces.